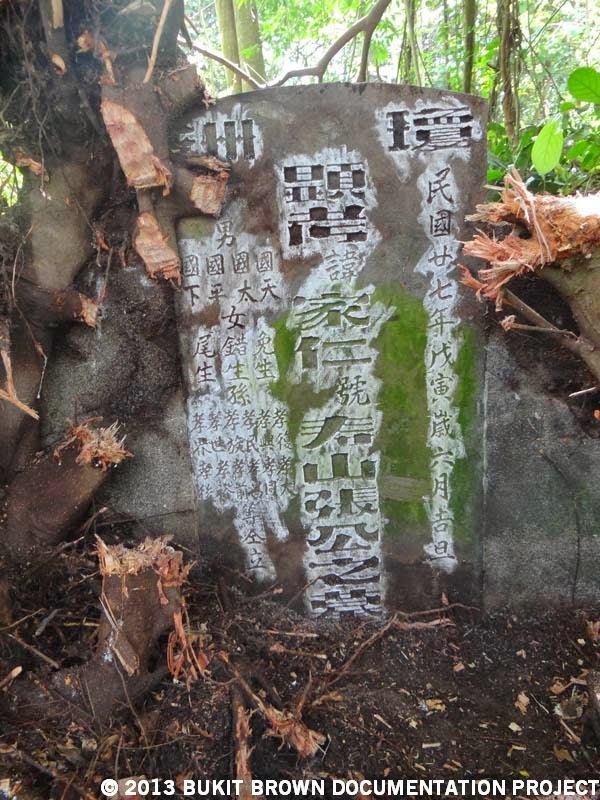 Located south of the Macritchie Reservoir and set in verdant green, Bukit Brown and its neighboring cemeteries collectively form the largest Chinese immigrant graveyard outside of China. In 2011, the decision by the Singapore government to build a new highway through this cemetery sparked a ground-up effort to save a disappearing facet of Singapore’s past. . 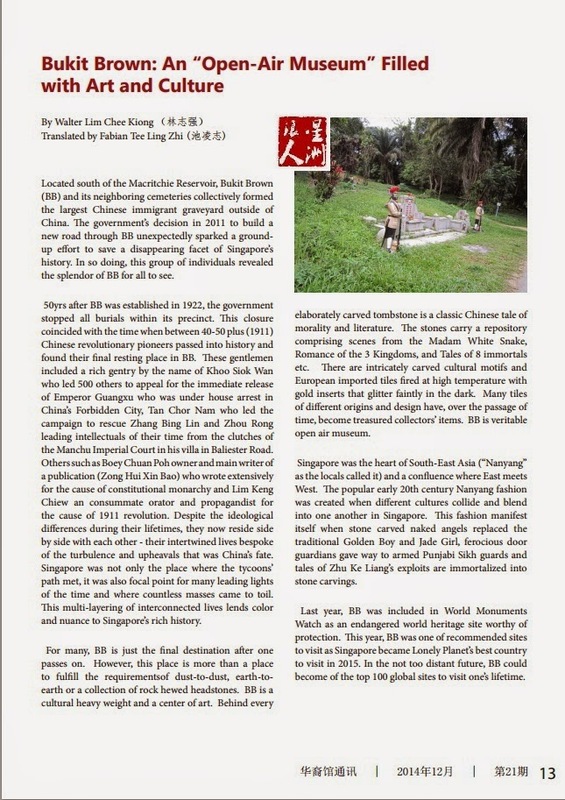 In so doing, this community of individuals started to unravel a forgotten history and heritage embodied and embedded in the stones of Bukit Brown. 50 years after Bukit Brown was established in 1922, the government stopped all burials within its precinct. 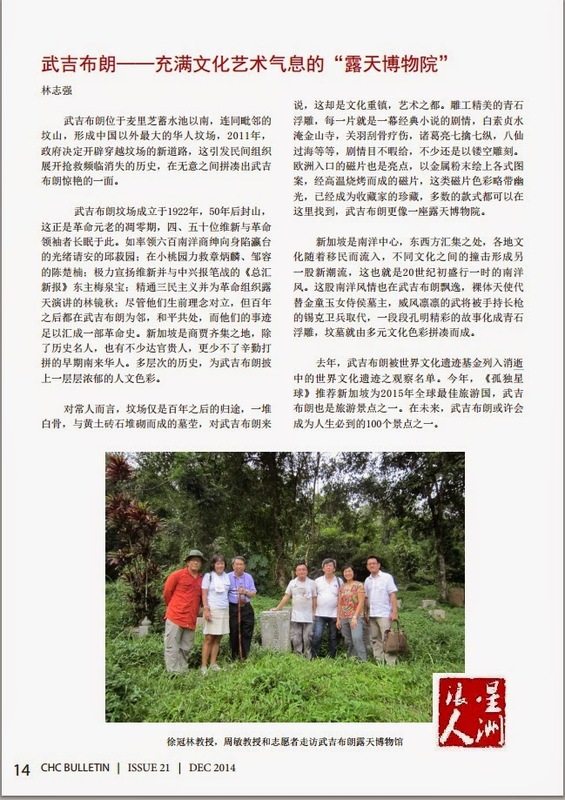 This closure coincided with the time when between 40-50 (1911) Chinese revolutionary pioneers passed into history and found their final resting place in Bukit Brown . These gentlemen included a literary and patriotic giant by the name of Khoo Siok Wan, who had led 500 others to appeal for the immediate release of Emperor Guangxu who was under house arrest in China’s Forbidden City, and Tan Chor Nam who led the campaign to rescue Zhang Bing Lin and Zhou Rong - the 2 leading intellectuals of their time from the clutches of the Manchu Imperial Court - to safe refuge in his villa in Balestier Road. 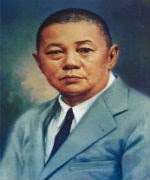 Others such as Boey Chuan Poh, owner and lead writer of a publication (Zong Hui Xin Bao) wrote extensively for the cause of constitutional monarchy and Lim Keng Chiew - a consummate orator and propagandist – lent weight to the revolution of 1911. Despite the ideological differences during their lifetimes, they now reside side by side, their lives intertwined, speak of the turbulence and upheavals that was China’s fate. Singapore was not only the place where the tycoons’ paths crossed, it was also focal point for many leading lights of the time and where countless masses came to toil. This multi-layering of interconnected lives lends colour, texture and nuance to Singapore’s history. Singapore was the heart of South-East Asia (“Nanyang”), a confluence where East meets West. The popular early 20th century Nanyang fashion was created when different cultures collide and blend into one another. This was made manifest, when stone carved naked angels evolved from the traditional Golden Boy and Jade Girl, armed Punjabi Sikh guards from ferocious door guardians and Western style lions from their mythical Chinese counterparts. Bukit Brown is in the World Monuments Watch list 2014 as an endangered world heritage site worthy of protection. In October this year, as Lonely Planet voted Singapore as the best country to visit in 2015, Bukit Brown is one of their recommended sites. In the not too distant future, Bukit Brown could well become one of the top 100 global sites to visit in one’s lifetime.